OK, can someone please explain this latest move by our young jailer/mayor? The other day the Daily Pilot announced, HERE, that Allan Mansoor - candidate for the 68th Assembly seat currently held by Van Tran - will bring the recently-approved agreement between the city and the firefighters union back to the council for re-consideration. Mansoor apparently appealed the decision from the earlier special council meeting just before the council meeting Tuesday. According to city officials, this appeal will now be held at the council meeting on September 1st. Mansoor and his "pal", Eric Bever, voted against approval at the earlier meeting. One can only assume that Mansoor thinks he's managed to sway one of the other council members - most likely Wendy Leece or Gary Monahan - to change their position. This move by Mansoor essentially freezes any action on that segment of the budget until the appeal is heard and voted on. If, perchance, he is successful in convincing one of his peers to change a vote, that really snarls up the budget process. Mansoor, based on reports, thinks the voting public didn't receive sufficient notice before the new contract was approved. He thinks there's not enough payoff for the city - he termed it, "only short-term savings". It's an interesting statement, since the public has not been privy to the agreements in the past. He's just posturing for potential donors to his campaign. The firefighters negotiated - key word there - the change to their Memorandum of Understanding and actually provided the city with much more savings than it had requested. According to one of their representatives, Fire Captain Jeff Janzen, HERE, the increased retirement incentive that seems to be part of Mansoor's complaint was not something the firefighters requested - the city needed it to attain the staff reductions as part of the 10-point plan to balance the budget. Throughout the public elements of the labor negotiations both Mansoor and Bever have shown an inexplicable stubbornness. In Bever's case it might be explained away because he failed to show up an most of the essential meetings during this process so didn't have a clue. It would appear that Mansoor is doing this for pure political posturing purposes. He markets himself as being a hard-liner on taxes, so I guess he thinks putting the city in a headlock at one of it's most critical times in history is a way to demonstrate that "characteristic". I just think he's being childish and stupid. I think he simply does not grasp the numbers, so feels obligated to say NO! An interesting sidebar to this particular scenario is that Costa Mesa is one of the very few cities whose rules allow the loser on a vote to call it up for appeal. In most other cities only a council member on the winning side of a vote can call it back for re-consideration. Perhaps we should revisit that issue in the near future. So, as the city staff hums the Jeopardy! theme we mark time, waiting until September 1st to see what, if anything changes. Meanwhile, some other city employees feel they were not treated fairly when they negotiated their concessions. Their union representative spoke before the city council last Tuesday, whining about the poor treatment they received. Now, that seems very strange to me. They negotiated - there's that word again - the changes that were approved. Perhaps the employees should be complaining to their paid union representatives. If any of the council members decide to revisit that issue, too, it will create chaos. This is what happens when you elect small people to big jobs... I warned you..
Congratulations to Assistant City Manager Dave Kiff for being named to replace his boss, Homer Bludau, as the new City Manager in Newport Beach. Kiff was among many candidates from all across the country considered. His appointment as announced today by Mayor Ed Selich in a special City Council meeting at 3:43 p.m., following the closed session in which the council discussed the appointment and his contract. Why, you ask, did I use a half-naked photo of Kiff on this piece? Well, it seems Kiff is a serious athlete - a 4-time Ironman participant who, according to some reports, rides his bicycle to work from his home in Laguna Beach. As councilwoman Nancy Gardner put it, "We have the most fit City Manager anywhere!" From all reports, the appointment of Kiff as City Manager not only insures continuity on some very large, very special project - like the new City Hall, for example - but fills that position with a man held in high regard throughout the community. Again, Congratulations to Kiff and to the City of Newport Beach for this choice. An interesting sidebar in this little drama was how quickly the news was presented to the public. The fledgling Newport Mesa Daily Voice, published by former Daily Piloteers Tom Johnson and Bill Lobdell, hooted early in the day that they would be first with the news of the appointment of the new City Manager. The Daily Pilot was also poised to break this news promptly. So, here I sat with two browsers open and the streaming video of the council meeting playing, waiting to see which outlet would break the tape first. As Ed Selich said the words at 3:43 p.m. the Daily Voice posted their announcement, HERE, with a nice bio on Kiff. The Daily Pilot posted their story about 10 minutes later, HERE. I suspect that, because Lobdell is also an Ironman competitor, he might have had the inside track on this story - it certainly looks like it. Regardless, our communities are well-served by two organizations working hard to present the important news of the day to their readers. Competition is good for that business. Thanks to both for their attentiveness. The Orange County Register finished with the bronze medal in this race. COSTA MESA LIBRARY FOUNDATION FUNDRAISER AT MIMI'S MONDAY! Well, first thing off the bat, the Costa Mesa Library Foundation is having a fund raising dinner opportunity for you Monday, August 17th (tonight, for most of you reading this early Monday morning). Yep, this is another chance for you to grab some great grub and participate in a contribution to the foundation. This one is at Mimi's Restaurant, 1835 Harbor Blvd., in the Courtyards Center. The event is scheduled from 4 p.m. - 8 p.m. and you MUST bring a flier to Mimi's and present it with your check to be sure the money is properly earmarked for the foundation. 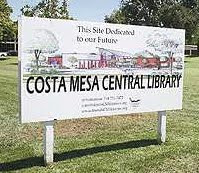 You can visit the Costa Mesa Library Foundation web site HERE for more information about the event. There's a link to a PDF file for the flier... just print it out and take it with you. See you there.. The Costa Mesa City Council will hold another meeting Tuesday evening at 6 p.m. in the council chambers at City Hall. Among the items on the agenda is yet another public hearing on the current moratorium on massage licenses and permits. The staff is recommending an extension of this moratorium for another 10 month and 15 days. They will also give a second reading to the ordinance amending the city's agreement with CalPERS to provide for an additional 2 years of service. The approval of this item will facilitate the early retirement of several dozen city employees as part of the "10-point plan" to balance the city budget for this fiscal year. And, the council will hear the proposal by the Parks and Recreation Commission to create a "City of Costa Mesa Public Service Memorial." While this seems like an idea worth discussing, the timing seems off considering the precarious condition of the city's finances right now.